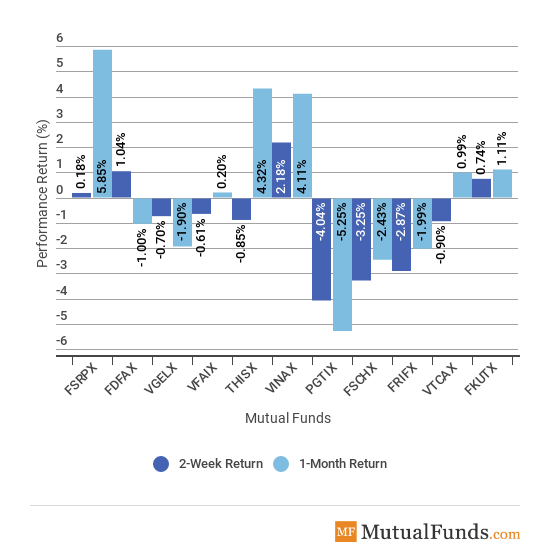 Every fortnight, MutualFunds.com provides a snapshot of the performance of some key mutual funds which tries to accurately capture the investor interest in specific areas of the financial markets. The report is aimed at providing a quick overview of the sectors, regions and asset classes that moved in a significant manner during the last two weeks. 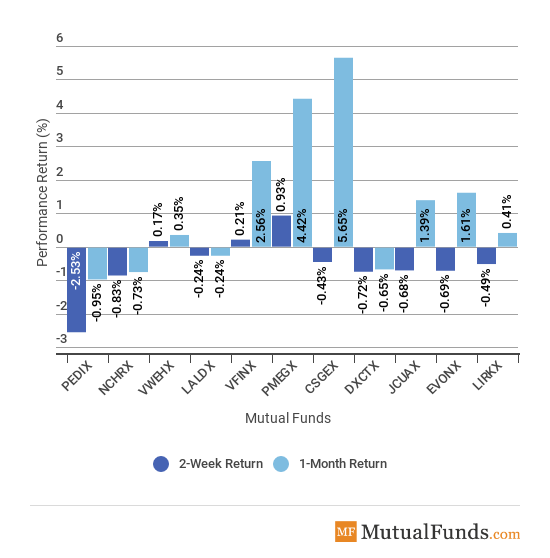 The carnage in equity mutual funds continued these past two weeks, with the flow picture deteriorating considerably. For the last two weeks, outflows from equity funds amounted to $14.3 billion compared to under $6 billion in the prior two weeks. Domestic mutual funds were the most hit with more than $8 billion in outflows in the last week alone. On the contrary, funds focused on the rest of the world experienced inflows of $1.7 billion. Bond mutual funds continued to be favored by investors, with estimated inflows of $6.5 billion in the past two weeks, up from $2.5 billion in the prior fortnight. Taxable bonds were the main beneficiary of the inflows, while municipal bonds saw an infusion of more than $300 million in the past two weeks. The European Central Bank signaled plans to end its Quantitative Easing program by the end of the year and keep interest rates at current record -low levels at least through the summer of 2019. The Bank of England kept interest rates steady at 0.75%, but a rosy picture of the economic output may require an intervention soon. The central bank warned of potential negative effects from a no-deal Brexit, although policymakers in the European Union made clear a deal was likely. The U.S. labor market has continued to tighten, with the economy adding 201,000 jobs for the month of August. Hourly wages shot up 0.4% month-over-month and 2.9% compared to the same month last year. We provide this report on a fortnightly basis. To stay up to date with mutual fund market events, come back to our news page here. Only the blue-chip U.S. equity funds saw positive performance for the two weeks ended September 14, as a batch of upbeat economic data amid a deteriorating picture in emerging markets boosted the appeal of U.S. stocks. While the S&P 500 (VFINX) was the best performer with a rise of 0.21%, Global equities ex-U.S. (VGTSX) dropped 1.5%. For the rolling month, the performance picture was more mixed. 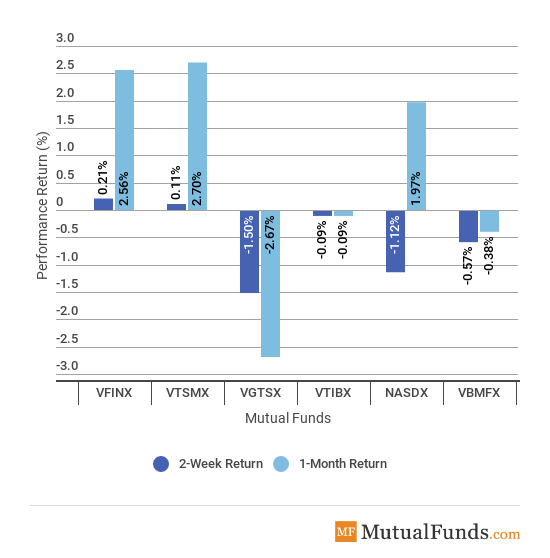 Vanguard Total Stock Market Index Fund Investor Shares (VTSMX), a broad index containing 4,000 companies listed in the U.S., advanced 2.70%. VGTSX, meanwhile, lost 2.67% over the same period. Check out our previous edition of scorecard here to see how the markets moved. The industrials sector (VINAX) was by far the best performer in the past two weeks, with a gain of 2.18%, as stocks are recovering from oversold territory following a spate of tariffs imposed by the U.S. on several trading partners. The technology sector (PGTIX) is the worst performer for the past two weeks amid fears a trade war between China and the U.S. will intensify. Big index exponents, such as Apple, which relies on China for its supply chain, could take a hit if the trade war escalates after President Donald Trump imposed another batch of levies on Chinese imports. PGTIX is also the worst performer for the rolling month, down 5.25%. The consumer discretionary sector (FSRPX) rose the most for the rolling month, just shy of 6%. 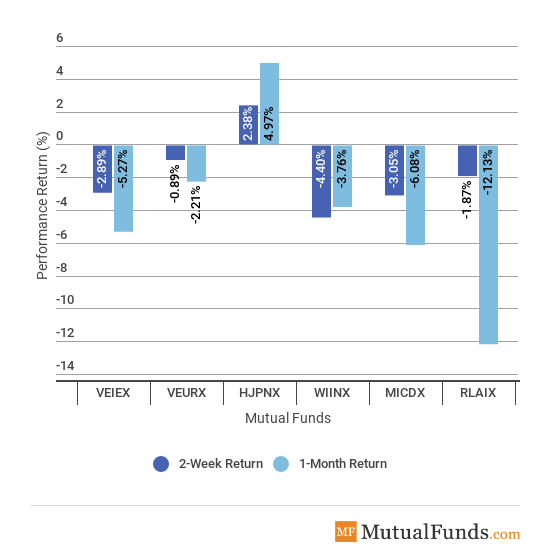 India (WIINX) is surprisingly the worst performer for the past two weeks, in part because of a Goldman Sachs report calling time on the stock market’s rally. WIINX declined 4.4% in the past fortnight. Amid rising worries about a trade war between China and the U.S. and the emerging markets carnage, Japan (HJPNX) provides safety to investors. HJPNX rose 2.38% in the past two weeks, the only riser from the pack. Unsurprisingly, the Japanese stock market is also the best monthly performer, up nearly 5%. Latin America (RLAIX) tumbled a staggering 12.1% for the rolling month, due to an ongoing currency crisis in Argentina, political uncertainty in Brazil and a humanitarian debacle in Venezuela. T.Rowe’s mid-cap equity growth fund (PMEGX) is the best-performing asset class for the past two weeks, rising a little bit below 1%. Meanwhile, PIMCO’s long-term bonds index (PEDIX) is down 2.53% for the past two weeks and 0.95% for the rolling month. For the rolling month, BlackRock’s small-cap index (CSGEX) remains the best performer, up 5.65%. The U.S. and Japan experienced the best performance for the past two weeks, in part thanks to their safe-haven status as investors are withdrawing money from emerging markets. The U.S. technology sector was badly hit due to a potential escalation of the trade war between the U.S. and China, while industrials got a respite. India saw heavy losses after Goldman Sachs predicted the rally was over and the carnage in Latin American equities continued. Be sure to signup for your free newsletter here to receive the most relevant updates.